Many patients deter from the opportunity to straighten their smiles due to the idea of having to wear metal brackets and wires. However, with Invisalign, you can have a straighter smile with convenience of removable clear aligners. Dr. Millan and the experienced team at our Hatboro dental practice are prepared to help you obtain a beautiful smile. For a convenient, discreet teeth straightening treatment, contact our Invisalign dentist today for a consultation! Known as a proven clear braces option, Invisalign treatment utilizes a set of custom-made aligners that gradually shift teeth into place. Created after an in-depth examination of your smile, you receive customized sets of aligners that are worn for two weeks at a time. You should wear your Invisalign retainers for twenty-two hours a day in order to obtain the best results. Invisalign retainers are removable and virtually invisible, which means that patients can achieve a healthier and straighter smile in an inconspicuous manner. Traditional metal braces are great for straightening teeth and correcting many orthodontic issues. Unlike metal braces, you are able to remove your aligners and eat and drink with virtually no food restrictions. With Invisalign, you also have the ability to brush, floss, and receive regularly scheduled cleanings easily rather than working around the wires, bands, and brackets of metal braces. Unlike traditional braces, which must be kept on a schedule to be adjusted to your straighten smile. 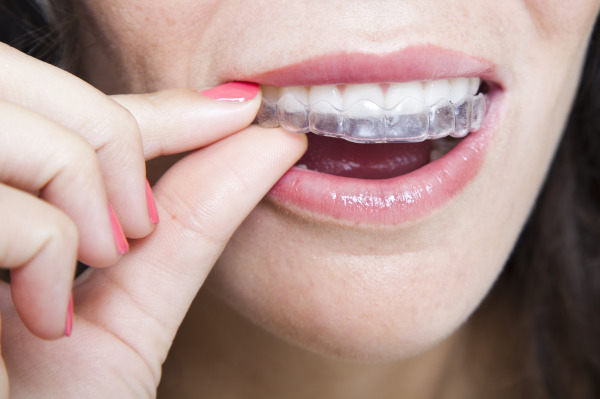 Approximately every month, you will visit our Hatboro dental office to receive a new set of aligners. Giving you the freedom to change out your aligners at your pace, with supervision from our Invisalign dentist. Your Invisalign consultation begins with a comprehensive examination of your dentition and bite. Dr. Millan will take the time to discuss the treatment option with you, answering any questions about the process and establishing expectations when wearing the clear braces. Invisalign is provided to correct similar orthodontic issues as metal braces such as crowding, spacing, and crooked teeth. Once you have been prepped, we will take impressions of your teeth and send these, as well as detailed x-rays, to the Invisalign laboratory. We invite you back to the office once the facility send back your treatment plan, as well as virtual time-lapse photos so you can see your future results. Dr. Millan will work with patients to see if Invisalign treatment aligns with your goals. The Invisalign system is an effective cosmetic dental treatment that has been used for many years to straighten teeth, close gaps, and correct bite issues. Our Invisalign dentists in Hatboro would love to discuss your treatment goals and determine if Invisalign is right for you. Schedule your consultation today!